As I ended the last post, I was literally shooing a herd of Elk from my camping spot here on the west side of the Park just north of Grand Lake. I love Grand Lake. It’s a pretty mountain lake surrounded by trees with wooden cottages and lodges mixed in. The village of Grand Lake is enchanting as well, with a history of early tourism dating back to the mid 1800’s. I could spend some time here. Gosh, I think I’ve said that before. 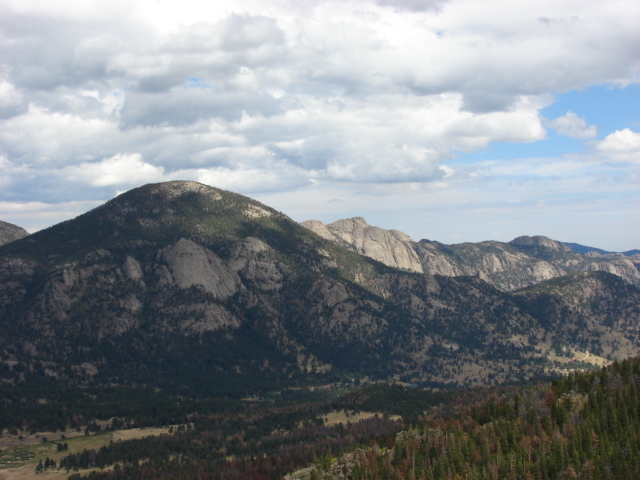 Rocky Mountain National Park , northwest of Denver, is set up in similar fashion to Glacier NP in that there is a West side and an East side with a road over the top of the mountains that connects the two. In this case, the East side, which I call the postcard side, is far more developed and therefore more populated, which makes me glad I have camped on the west side even though this is the least attractive NP campground I have seen so far. 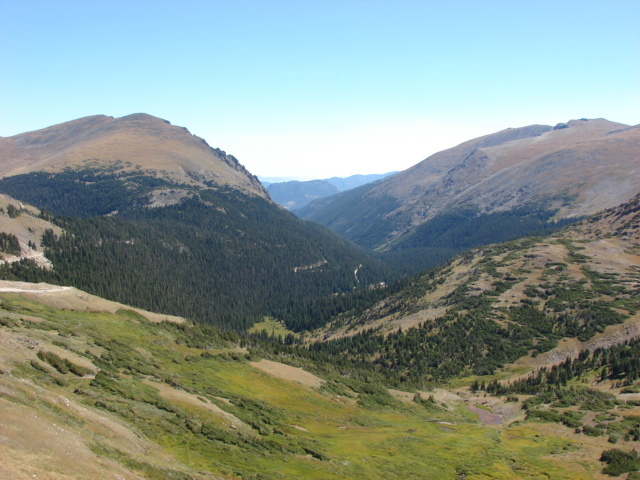 The road over the mountains, called the Trail Ridge Road, rises to an elevation of 12,154ft at its highest point. Where’s the oxygen? Poor Misty Moo, she’s been breathing hard just from walking for a few minutes around the campground, which is at elevation 8,800ft. I thought she might get pulmonary edema when we drove over the top to the other side, but she was fine. No oxygen or emergency descent necessary, thank goodness. The trailheads on the west side of the Park are mostly between 9,000 and 10,000ft, so I did my best to hike the flatter of the hikes available. Here are a few shots taken while I was out and about on the trails. 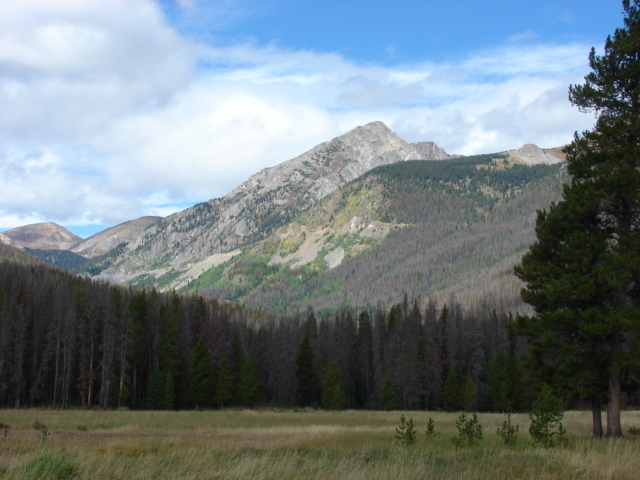 This is a shot of Mineral Peak (11,488) across the Kawuneeche Valley where I scared up a resting herd of elk while I was on the hunt for a geocache. 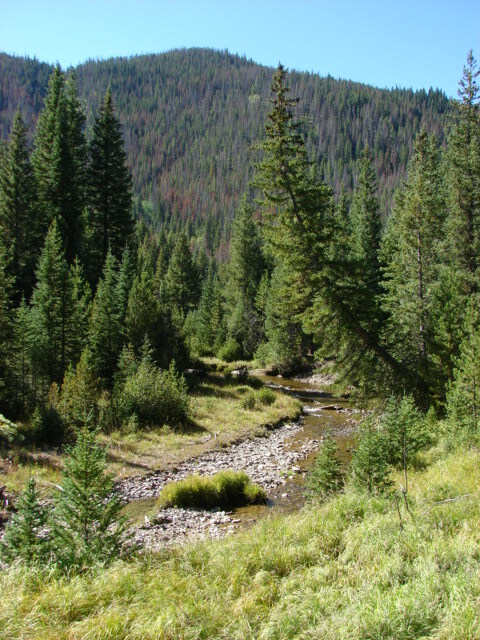 This is the Colorado River not far from its headwaters. 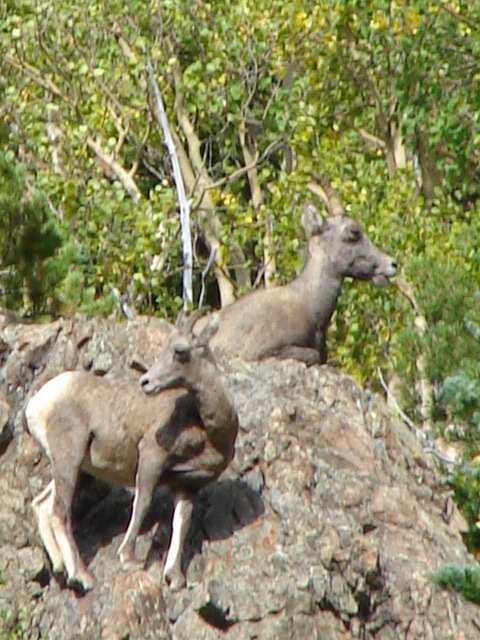 And these are some big horned sheep ewes I spotted high up on the rocky ledges while hiking near the Colorado River. This morning, I went into Grand Lake for a massage as my back, neck, and shoulders are a bit sore from driving 3,835 miles. Yes, folks, I have driven 3,835 miles since leaving Anchorage on August 8th, and I haven’t spent the night in a Wal-Mart parking lot yet. That seems like a lot of miles, but I guess if you are going to drive around the Country, you’ve gotta log some miles. I haven’t checked, but I think I have a little over a thousand more to go. It won’t be long before I turn left into Kansas and then it’s a straight shot to the mountains of North Carolina. After my massage, the predicted thunderstorms were rolling in on the horizon, so instead of hiking, I grabbed the dogs and Lil’ Pea for the drive over to the other side. Here are some shots I took along the way. 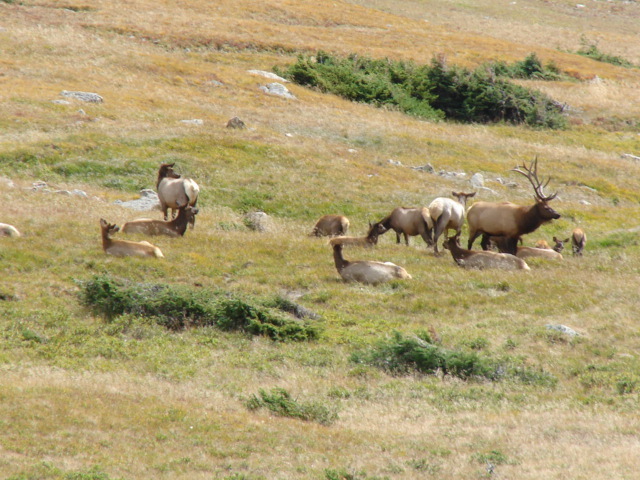 The most fun was watching a Bull Elk gather up his cows and run off another Bull Elk. 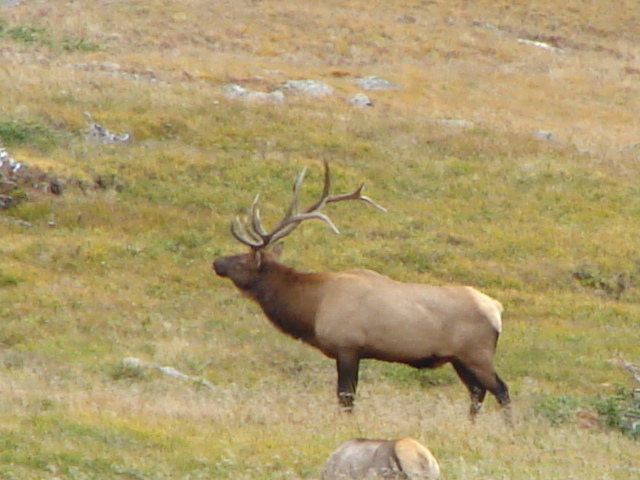 You see, it’s what they call the “rut” also known as mating season, and the Elk are quite riled up as a result. The best I could tell from what I saw today was the Alpha Bull had gathered up a harem of about 25 cows, some of which are pictured here. Across the road and up the hill a bit was another large Bull with only two cows. Poor fella. The Alpha Bull clearly wanted ALL the cows because he ran partway up to the three of them, stopped and bugled for all he was worth, I guess telling the two cows to ditch that good for nothing Bull and come join him. After a time of shaking his antlers, bugling, stomping his feet, and showing off in general, the cows must have decided that he had more to offer than the Bull they were with, so they did indeed ditch the inferior Bull and run over to join the harem of the Alpha Bull. Too funny. In addition to these theatrics, there were also two young Bulls hanging around the main herd/harem. The Alpha Bull tolerated these youngsters, but only on the periphery. When one of them got too close to the cows, the Alpha Bull would run over and bugle at him to back off, which they did. Most entertaining. I could have watched for hours, but was run off by the thunderstorms that finally hit. I found it interesting that, at over 12,000ft, it was rain and not snow. Shouldn’t it be snow? Guess not. 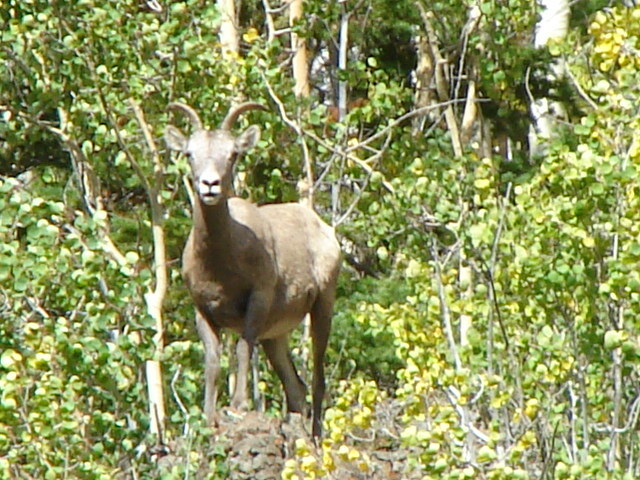 Here are some shots taken from high up on the Trail Ridge Road as it was going over the top of the mountains. 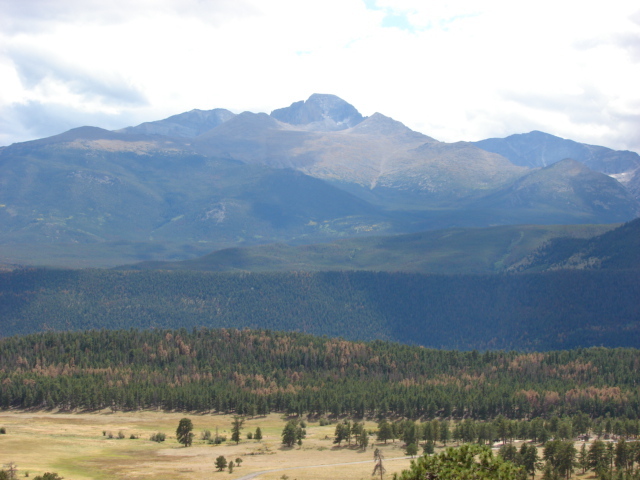 This first one was taken at about 12,000 ft.
And this one is Longs Peak, which is the highest peak at 14,259. Rocky Mtn. NP hosts some of North America’s highest peaks…outside Alaska, of course. It’s about 8pm and I just took the dogs out for a turn around the campground. I wish you could have heard all the noise coming from the adjacent meadow. It was crazy. All the bugling and squealing sounded like a cross between stuck pigs and a very loud hinge being worked back and forth. Those elk sure are having high times these days, that’s for sure. It reminds me of the moose in the Powerline Pass in Anchorage. They gather there this time of year for the same reason, and boy are they ever riled up. It’s best to steer well clear unless you want to be charged from a half mile away. That’s it from Rocky Mountain National Park. It’s off South to the Pike’s Peak area tomorrow, so stay tuned. I am still enjoying your wonderful travel tales.I have been a few of the places you mentioned. Pike’s Peak ( driving) is an adventure all to it’s own. I saw a BIG jet flying below us!!. I have a friend who would like to be included in your traveling experiences. could I share some of your blogs with him.? He is my supervisor at work. Let me know!!! Stay away from the forest fires.